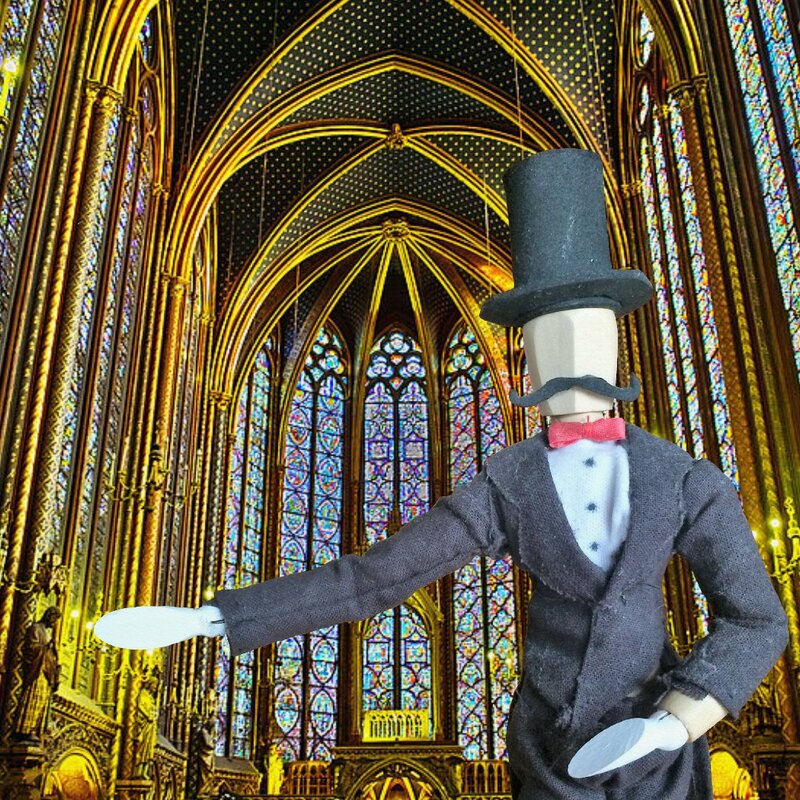 Today we’re off to Paris to visit the chapel of Sainte Chapelle! 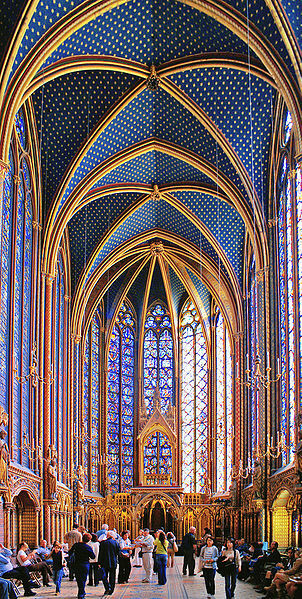 As my favorite art history professor once encouraged in her sage travel advice, “If you ever go to Paris and visit Sainte Chapelle, try and find an excuse to be in a wheelchair, because the only wheelchair-accessible entrance is through the king’s door.” So…go break a leg or something, so we can join Sylvester in being uppity. 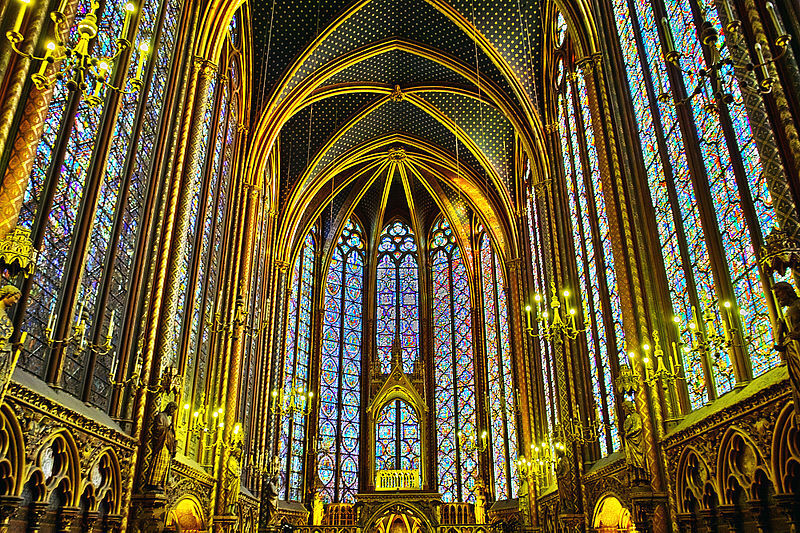 Sainte Chapelle is built in the Gothic style of art. It was named for a tribe in power throughout Europe between the fifth and eighth centuries, just before the rise of the Holy Roman Empire. 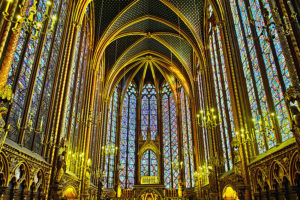 Their style of architecture was much more elaborate than what was previously used, and from 1000 to 1400, in times of peace, architects had time to improve on their style and many gorgeous cathedrals went up as a result. Most characteristic of the Gothic style is the high, pointed arch in the ceiling. This was called a thrust, and its shape actually required less support to hold it up, meaning that the pillars didn’t have to be as big as in the past. In addition, intricate embellishments in stone, detailing various focal points around the churches, became more common. The structural advances allowed for bigger windows, letting in more light and creating the opportunity for more stained glass art. Sainte Chapelle is a royal chapel (hence, Sylvester wanted to talk about it) built between 1241 and 1248 by King Louis IX to house the Holy Relics of the Passion. It is considered to be one of the greatest examples of Gothic architecture in France. 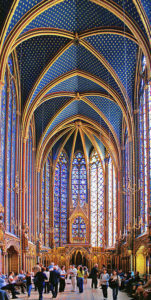 Its structure is sweeping and delicate, but it is best known for its stained glass art. The entire chapel glows with color because the architecture allows for an unusual amount of glass in its walls. From inside, it appears that the walls themselves are made of glass, glass which is rich with Christian imagery. The church holds 1,113 figurative glass panels, setting it on a pedestal of stained-glass wonder. 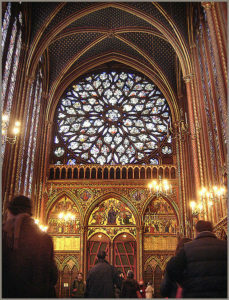 The chapel truly embodies all that Gothic architecture strove to achieve, and this particular phase of Gothic art was called rayonnant (which comes from the French word rayonner), meaning “to radiate light.” The style of Sainte Chapelle inspired many architects, and churches throughout Europe were afterward constructed in styles based on that of the royal chapel.